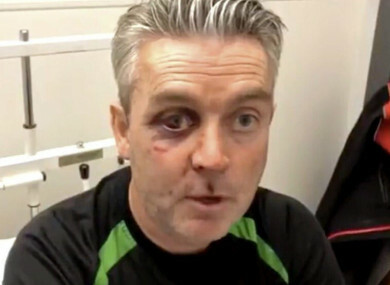 FOUR MEN HAVE been arrested in relation to an assault on a referee after a soccer match in Westmeath earlier this month. Gardaí said they had arrested the four men – two in their 20s, one in his teens and one in his 40s – this morning following investigations into the assault. Referee Daniel Sweeney suffered a broken jaw and fractured eye socket when he was attacked after showing a red card during the match. He underwent a five-hour operation and will spend the next six to eight weeks recovering. Following the incident, the FAI handed down 40 year bans to three Mullingar Town players last week. Mullingar Town football club also apologised for the incident, calling what happened “a black day” for the club. All four suspects are detained under Section 4 of the Criminal Justice Act 1984. They are detained at Mullingar, Tullamore and Birr garda stations. Email “Four men arrested in relation to assault on referee after soccer match”. Feedback on “Four men arrested in relation to assault on referee after soccer match”.